Atmosphere observation refers to all equipment and techniques used to study properties of the atmosphere, including temperature, pressure, air movements, and chemical composition. Basic instruments for measuring the atmosphere, such as the barometer, were developed during the seventeenth and eighteenth centuries. However, these instruments were useful at first only in studying atmospheric properties close to the ground, not at very high altitudes. Over time, weather instruments were eventually carried into the atmosphere by devices ranging from kites to satellites. One of the first means developed for raising instruments to higher altitudes was the kite. In a famous experiment, American statesman Benjamin Franklin used a kite in 1752 to discover that lightning was nothing other than a form of electricity. Within a short period of time, kites were being used by other scientists to carry recording thermometers into the atmosphere, where they could read temperatures at various altitudes. An important breakthrough in atmospheric observation came in the late eighteenth century with the invention of the hot-air balloon. Balloon flights made it possible to carry instruments thousands of feet into the atmosphere to take measurements. For the next 150 years, balloons were the primary means by which instruments were lifted into the atmosphere for purposes of observation. A number of devices were invented for use in weather balloons. The meteorograph was designed to be sent into the atmosphere to automatically record certain measurements, including temperature, pressure, and humidity. The radiosonde is similar in design to the meteorograph, but also includes a radio that can transmit the data collected back to Earth. A radiosonde that is used to collect data about atmospheric winds is known as a rawinsonde. Balloons are still an important way of transporting weather instruments into the atmosphere. 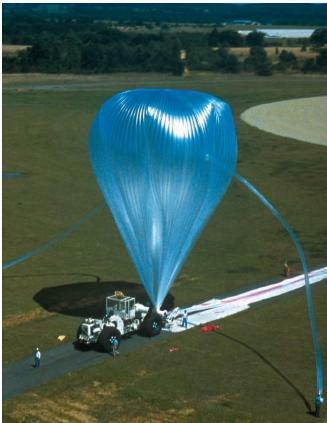 Balloons used to study the properties of the upper atmosphere are known as sounding balloons. The invention of the airplane and the rocket allowed weather instruments to travel considerably higher than they had ever gone before. Although both can carry the same types of instruments as balloons (only much higher and with greater efficiency), they have taken on tasks more complex than the measurement of atmospheric temperature, pressure, and air movements. For example, airplanes are used to study the properties of hurricanes and to measure levels of ozone and related chemicals over the Antarctic. Such measurements will be valuable in helping scientists to better understand the chemical processes that occur in the atmosphere and the effects they may have on future weather and climate. Artificial satellites are the most sophisticated atmospheric observational systems. Lifted into Earth's orbit by a rocket, a weather satellite carries inside it a large number of instruments for measuring many properties of the atmosphere. The first weather satellite ever launched, TIROS 1 (Television and Infrared Observation Satellite), was put into orbit by the U.S. government on April 1, 1960. One of its primary functions was to collect and transmit photographs of Earth's cloud patterns. Since that time, a number of other weather satellite systems have been put into operation. Satellites can provide a variety of data about atmospheric properties, contributing to improved weather forecasting. As an example, a satellite can track the development, growth, and movement of large storm systems, such as hurricanes and cyclones. Meteorograph: An instrument designed to be sent into the atmosphere to record certain measurements, such as temperature and pressure. Radiosonde: An instrument for collecting data in the atmosphere and then transmitting that data back to Earth by means of radio waves. Rawinsonde: A type of radiosonde that is also capable of measuring wind patterns. WHAT IS THE SIGNIFICANCE OF OBSERVATION AND MEASUREMENT OF ATMOSPHERIC PRESSURE?